Posh man Danny Lloyd hides his embarrassment at the final whistle. Photo: Joe Dent/theposh.com. Without a ball at his feet, Peterborough United’s star man Marcus Maddison is not known for his eloquence. But he summed up this incredibly witless, inept, most frustrating, inexplicable loss pretty well as Posh bade farwell to 2017 not with the expected bang, but with an embarrassing whimper. Marcus Maddison in action for Posh against MK Dons. Photo: Joe Dent/theposh.com. All of which is true, but he did miss out some important information, namely out-of-form opponents who played with nine men for a full 65 minutes, a situation that appeared to completely baffle those charged on and off the pitch with securing a fourth straight League One win. Football is a simple game we’re told and playing with two extra men for over an hour against a team who hadn’t won since November 11 should have been ridiculously easy for a team intent on promotion. Sure the red cards pulled a struggling side together and inspired home support noise rarely heard at stadium:mk, while the MK players took gamesmanship to an extreme level (as, sadly, would any other professional outfit), but they would have been footnotes to a comfortable away win had Posh displayed any sort of gumption, patience or even a discernable gameplan. Faced with a two-man advantage, Posh went with three at the back, but kept two centre-backs not entirely comfortable starting attacks on the pitch, and finished with four defenders, including two midfielders whose forward passing is not exactly a strength (the most comfortable midfielder on the ball, Chris Forrester, had been taken off at half-time, presumably as he’d been cautioned), and a centre-half at centre-forward, always the last resort of the desperate. The result was confused panic, muddled thinking, too many shots taken from too far out, too many easily-intercepted or overhit crosses and a passing display that must have infuriated the midfield maestro running the show. Posh striker Jack Marriott beats MK Dons 'keeper Lee Nicholls to this cross. Photo: Joe Dent/theposh.com. Remarkably the best Posh opportunity to score arrived on the breakaway, against nine men. Jack Marriott fed Danny Lloyd whose shot was well saved by MK Dons goalkeeper Lee Nicholls, who defied regular bouts of exhaustion and apparent injury to play rather well when called upon, which wasn’t that often, given the circumstances. 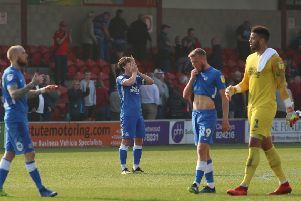 Maddison hit the bar late on when he should have scored, but even playing poorly he carried the most threat, Nicholls thwarted him twice from the edge of the penalty area, the furthest Posh could ever get before losing possession. Joe Walsh was the first MK player to see red for his clumsy foul on Marriott as the division’s top scorer bore down on goal following Andrew Hughes’ fine long pass in the ninth minute, an act that actually inspired the home side to take control. Peter Pawlett missed a sitter before he and Chuks Aneke were splendidly denied by Posh goalkeeper Jonathan Bond, but Aneke scored from 18 yards following a poorly-defended short corner with the aid of a deflection. No need to panic of course and when Osman Sow was despatched for stretching his lanky leg too close to Ryan Tafazolli’s face seven minutes before the break, all should have been well. But what followed merely encouraged those who believe Posh are a one-trick pony, a team with a Plan A and nothing else, a team with two outstanding attacking talents, but no depth to a squad lacking creative midfielders, reliable full-backs and striking support for free-scoring Marriott. If Maddison and Marriott are firing there’s a good chance Posh will win, especially if teams, like Bradford City on Boxing Day, feel obliged to attack. Posh have good counter-attacking ability and a defence happy to soak up pressure and deal with crosses from wings to a big man. McCann bravely suggested Posh would have won playing 11 v 11, but there was a point to his comment. If Marriott had been allowed to enter the penalty area early in the game by Walsh and he’d scored, the confidence of a team used to winning would have rocketed and a side with one win 13 League One matches would have been deflated, but it was a moot suggestion. Games don’t always pan out as expected and the ability to make on-the-hoof adjustments are a vital part of a successful manager’s make-up. McCann was hampered at stadium:mk by a lack of playing resources, a fact now compounded by a lengthy absence for key midfielder Gwion Edwards. First-up from the bench was Junior Morias, a great lad who was understandably rusty making his first appearance since picking up an injury in September. Then came Leo Da Silva Lopes, who was stationed out wide, but kept running inside into crowded areas and finally Jermaine Anderson whose confidence is so lacking he never really looks like he wants the ball and he certainly isn’t keen on passing it in a forward direction. First-team regulars were also found wanting. Anthony Grant has been superb at breaking up attacks this season, but faced with time and space with the ball at his feet he appeared lost and never likely to influence a game in these extreme circumstances. Marriott was also found wanting when denied space in behind which he was once MK started losing players. Even nine minutes of time added on for timewasting never looked likely to save Posh. Indeed a few of those minutes were spent in the Posh half. Unused substitutes: Conor O’Malley, Idris Kanu, Liam Shephard, Lewis Freestone. MK Dons: Lee Nicholls, George Williams, Joe Walsh, Ousseynou Cisse, Scott Golbourne, Ethan Ebanks-Landell, Alex Gilbey, Peter Pawlett (sub Kieran Agard, 84 mins), Conor McGrandles (sub Ed Upson, 84 mins), Osman Sow, Chuks Aneke (sub Robbie Muirhead, 75 mins). Unused substitutes: Wieger Sietsma, Scott Wootton, Gboly Ariyibi, Ryan Seagar. Goal: MK Dons - Aneke (27 mins). Sendings off: MK Dons - Walsh (denying a goal scoring opportunity), Sow (Serious foul play). Cautions: Posh - Forrester (foul), Tafazolli (foul). MK Dons - Gilbey (foul), Golbourne (dissent), Williams (foul).